Each monsoon the soaring stilts that hold up the houses of Kampong Phluk prove their worth, as the dusty Cambodian village is transformed into a deep waterway. 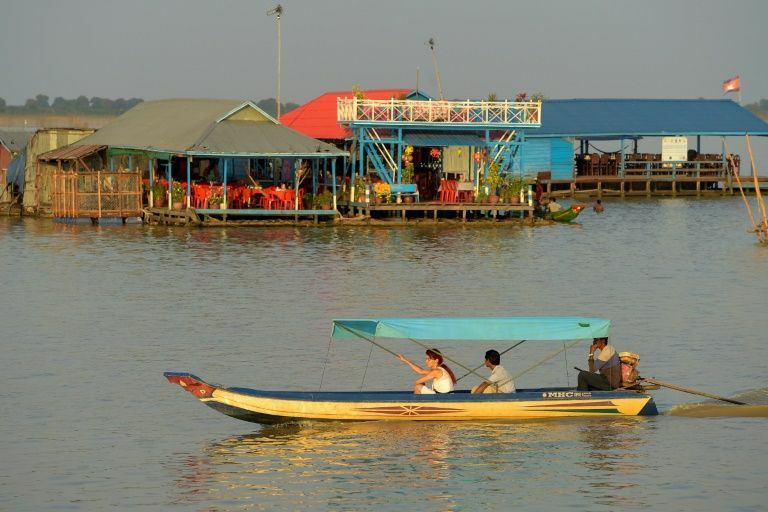 The village, a short tuk-tuk ride from the ancient Angkor ruins, is on the floodplain of Southeast Asia’s largest freshwater lake, Tonle Sap. The lake swells between the dry and wet seasons, expanding from covering an area of 2,500 square kilometres to several times that size at the height of the monsoon rains in September and October. When Kampong Phluk floods, residents also change their pattern of life, clambering up sheer wooden staircases to the dry of their homes and moving around by boat. After a lifetime of seasonal change in an otherwise sleepy village, 80-year-old Ta Nguon says he is excited to see the growing influx of tourists. “For the last few years tourists have flocked to our village to see these houses, mangroves and the sunset over the Tonle Sap,” he said, sitting on a bamboo platform under his house during a hot recent afternoon. With the arrival of the rainy season, scores of boats wait to ferry tourists along a canal which cuts through the village to the main body of the Tonle Sap and its floating restaurants. They bring good money to the 1,000 families of Kampong Phluk, off-setting the decline in fish catch from Tonle Sap lake, which is fed by the heavily dammed Mekong River. The Tonle Sap is a source of sustenance and survival for more than one million people, according to the Mekong River Commission. But the tourist influx is not without its downsides. Some locals complain of trash and oil pollution from the endless boats carrying visitors around the homes and the lake. But for American tourist Elizabeth Wilson the rhythm of lake life and the adaptation of its villagers is a marvel. “It’s a great way to spend the afternoon or morning exploring, staying on the little boats, seeing the beautiful lake, it’s an amazing place,” she said.